It was my first time to witness this ritual of thanksgiving to the ancestors. Astral blessings are a must in everyone’s life. But I only knew it theoretically till I attended this ritual with Mohanji. Mohanji belongs to Bharadwaja Gotra in this life. With the Priest’s powerful chanting of mantras, the reverence and gratitude with which Mohanji invoked the presence and blessings of Ammu as well as all the ancestors in his (Bharadwaja) Gotra, and most importantly, of Ganga Putra Bhishma Pitamaha, indeed melted my heart. Bhishma Pitamaha, son of Ma Ganga, was unmarried. Since Bhishma of Mahabharatha did not have a son, who would perform this post death ritual for him? So, all those who do shradh (rituals associated with the death anniversary of their beloveds) in Ganges, start with Bhishma, with the belief that we are all his grand children. The ritual is rather elaborate and consists of prayers of gratitude to Sun, all the Gods and Deities, Fore fathers, Saints and, in Mohanji’s case, Ammu. Mohanji did it meticulously with full concentration, as the photos speak. Lord Dattatraya, who is the Adi Guru with whom a great tradition of powerful incarnations such as Shirdi Sai Baba, Sathya Sai Baba, Gajanan Maharaj, Narasimha Saraswati and Swami Samarth of Akkalkot began, meditated in Tapovan. That place is currently within the Shivananda ashram hill enclave. We went to Lord Dattatraya’s temple. It was wonderful to see Mohanji bowing down and prostrating to the highest Guru of the tradition with complete surrender and gratitude. That offering of gratitude came from his being. It had complete faith and surrender. He said: ” We must have total and complete gratitude and surrender to all the Masters who are living as well as “non-living” in the physical realm. Remember, in the absolute sense, all of us are one with every Master as well as God.” We prayed at the Dattatreya Mandir and the adjacent Devi Mandir.We could not go to the cave (there is a way to go to the cave where Lord meditated, but presently it is blocked for public). I must have visited Datta Mandir many times till today, but now I feel those were superficial visits to the temples. Visiting with Mohanji, and with understanding of the tradition and Masters, had a lot more meaning into it. 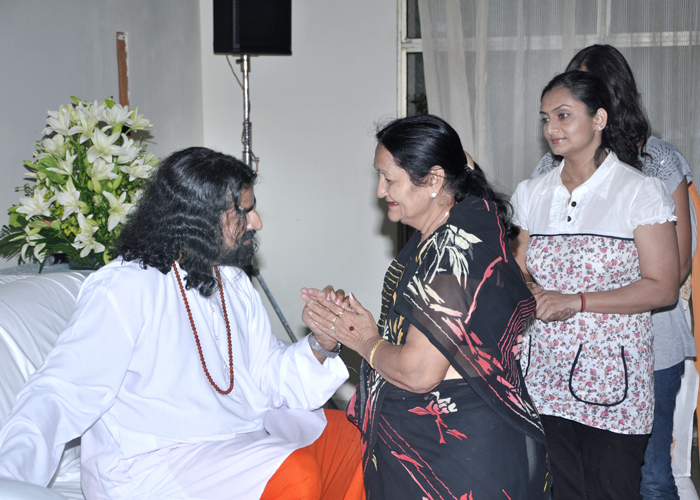 It was so pleasant to see my Guru surrendering to the highest Guru with deep meaning. I just questioned myself… who am I to boast about myself? I am such a negligible entity who cannot even comprehend the surrounding and happening at the conscious or subconscious level. We came to the Samadhi of Saint Shivananda. He was one of the great saints that ever walked on earth. He was part of the trinity of great saints of this area in early 1900s. The others were Purushottamanand Maharaj of Vashishtha Cave and Tapovan Maharaj who was a wandering monk. Shivananda Samadhi was empty and none was there except me and Mohanji. Mohanji said that it is very rare. We could go around the samadhi and prostrate without any hindrance. Usually, this is not possible because either some of the swamis will be meditating, or they would be doing poojas, which happened soon after we came out of the samadhi sthan. It was a great experience. 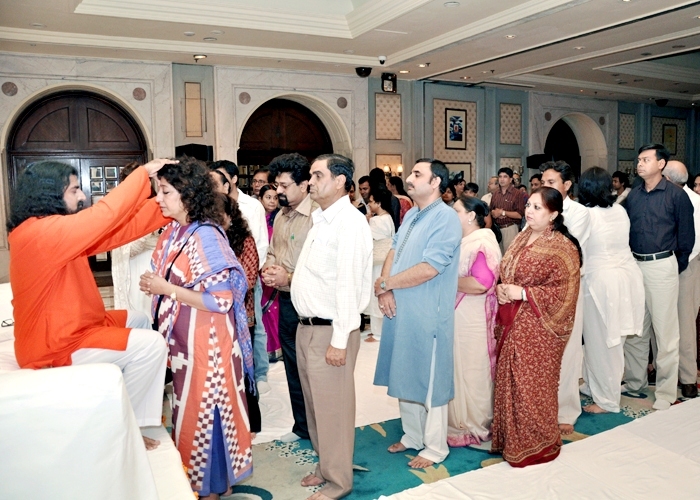 I felt as if I am prostrating at Sai Samadhi in Shirdi – great vibrations were felt clearly. Indeed, Shivananda is a great saint. Sathya Sai Baba had come and stayed in this ashram twice – first time when Swami Shivananda was in his body, and the second time after his maha samadhi. After praying at Sivananda Samadhi, we took guidance from an ashramite to locate the abode of Swami Govindananda, who is in charge of Shivananda’s Library. He welcomed us with open arms, as if he was waiting for us. As soon as we sat down, he gave Mohanji a picture of Shirdi Sai. 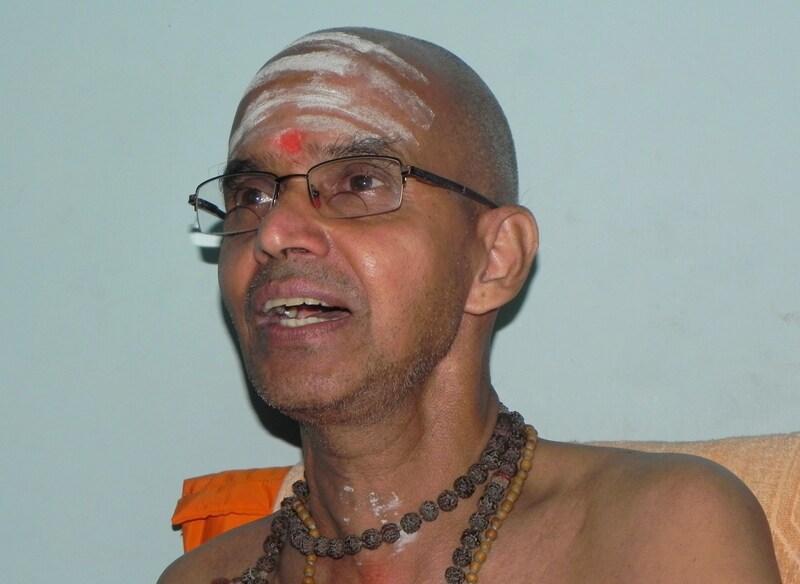 Tejus of Swami Govindananda was unmistakable. 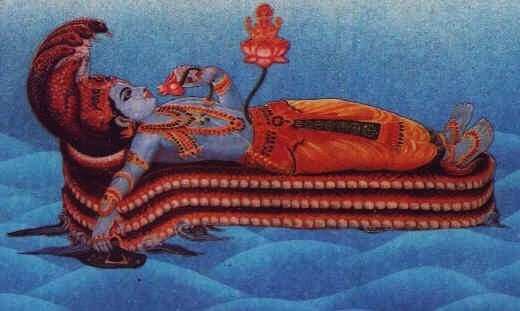 Mohanji gave him his spiritual card in which his third eye was clearly visible. Swamiji looked intently at the card for sometime, totally ignorant about the activities or people around him, and at one point exclaimed “Mohan, you are residing in Sai Baba’s third eye!!!”. Later, during discussions, Swami Govindananda said that Shivananda Samadhi has same vibrations of Shirdi Sai Samadhi!!! I reflected back on my experience. It was indeed a beautiful demonstration of the fact that Masters/Divine are all pervasive. I remembered what Mohanji always says, “In absolute sense, all Masters are one and we are one with them.” I felt our conscious human mind is so conditioned to separate things, identify them individually and create differences and duality. Vanamali Mataji has a routine of Krishna pooja and arati in the morning and evening. 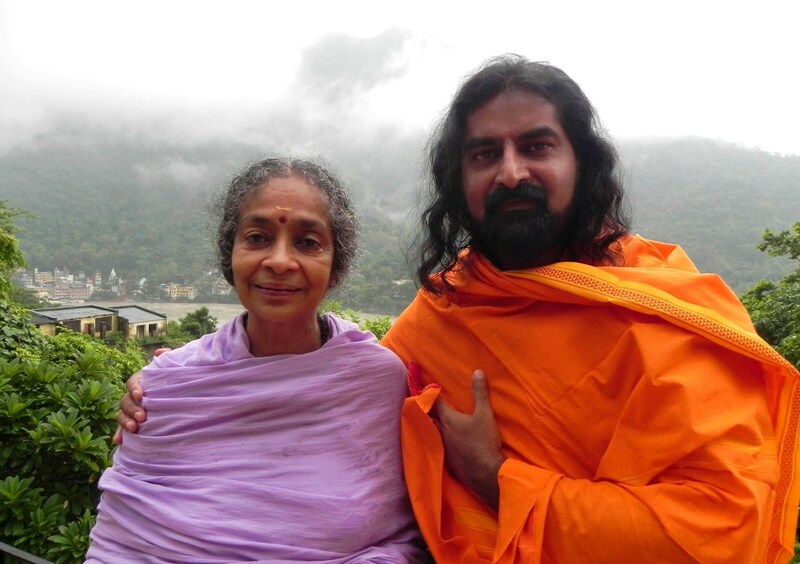 On one morning, during Pooja, I was sitting behind Mohanji, who was seated behind Mataji. 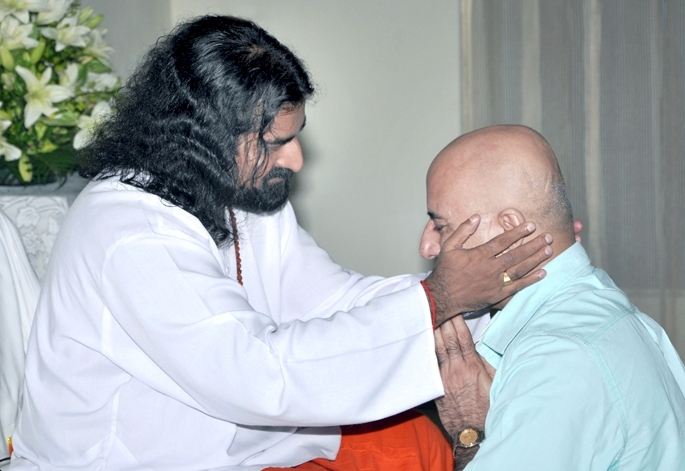 Suddenly, Mohanji asked me to close my eyes and keep my hand on his right shoulder and feel. His shoulder had the lull of a deep ocean, majestic and tranquil.I felt myself completely shifted to a new realm. There was a soothing wave-like movement, as if I am floating over a calm and serene ocean. I could feel the gentle, synchronous, up-down waves which are going beyond horizons. These waves were very tranquil and compassionate. This state is truly inexplainable. I had seen so many of expressions of Mohanji by now, that, as usual… I got confused. A few seconds later, Mataji and Mohanji started chanting Vishnu Sahasranam. Feeling Vishnu consciousness and then listening to Vishnu Sahasranam in Mohanji’s deep voice, which comes from his being, threw me into deep meditation, giving me entirely different experience than before. It was more tranquil and dissolving. He had shifted into Vishnu consciousness before chanting the Sahasranam, and thus did not need to refer to any books! 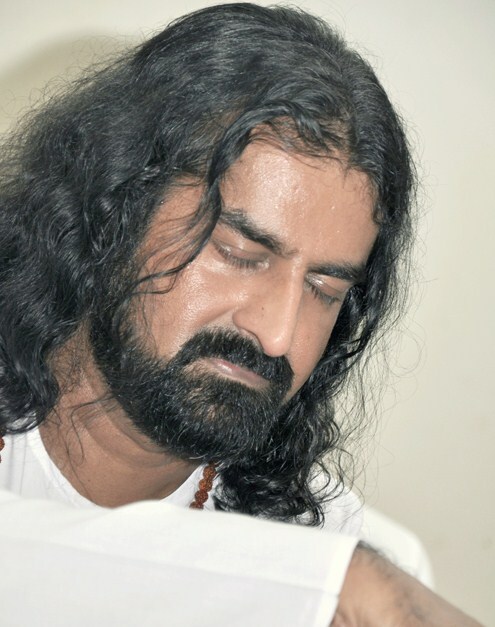 I asked him, ‘When do you, or, did you ever recite all these mantras and shlokas?’ Witnessing his busy schedule in Muscat, I wondered when he gets the time!!!. 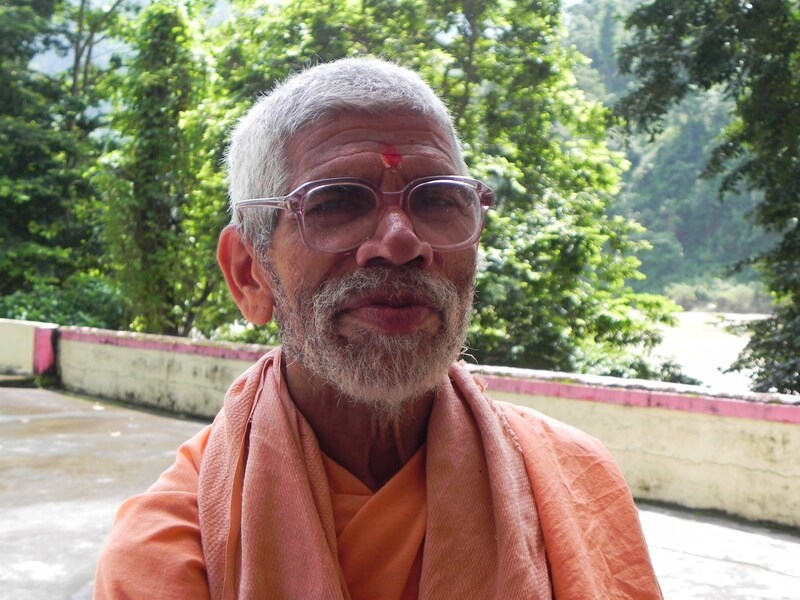 Mohanji said that he has not read or mastered any scriptures, Vedas or Upanishads. Knowledge flows through him when he needs it, as per the Divine will. He said: “I am an empty pot. I reflect what fills into me, time after time. I do not exist. I do not compare nor do I compete. I do not borrow or imitate. I have nothing. I am an embodiment of total emptiness, if you can understand or comprehend that. I exist because you do, as my existence is relative. Great Masters have walked this earth time after time. I bow to all of them. I surrender myself to all of them”. 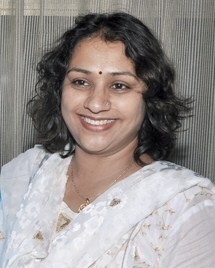 Santoshi is a lady working at Mataji’s ashram. Mataji once just mentioned that, she is very sick and often does not come for work. She had become thin too. Mataji asked Mohanji to do something. 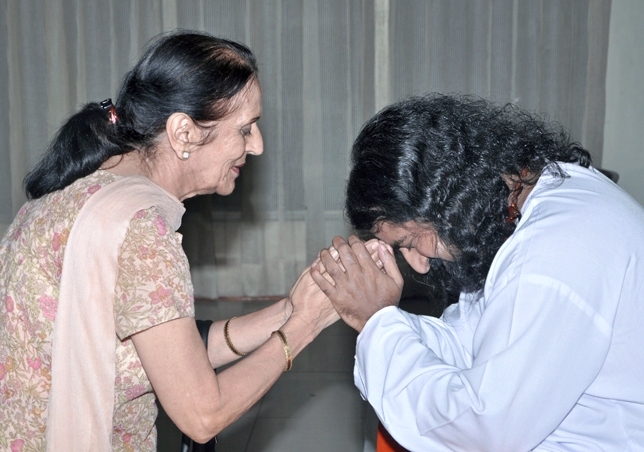 I asked for her to come to ashram with her medical reports. She had a few abscess on her body and was extremely fatigued. Seeing reports I thought she may require long term treatment to fully recover. Mohanji gave her Shaktipat. After Shaktipat she felt a bit dizzy and lost. She cried a lot and hurried home. This was the day of Krishna-Janma, birth day of The Lord Krishna. I was a bit worried looking at her condition, but had full faith in Mohanji. Later she came for evening arati of Krishna and gave us a big surprise as she looked of being happy and bubbly. She conveyed shyly that she feels very light! Mohanji also gave Shaktipat to Mataji. That sight was so touching, son giving Shaktipat to his spiritual mother. Mataji experienced both Shiva and Vishnu consciousness! She said, “This was the deepest experience indeed”. What a subtle appreciation. All of us were filled with deep love and joy. I saw many forms and expressions of Mohanji in the last few months. His body configuration changes drastically and very often. Sometimes he walked like Shirdi Sai Baba, slightly limping like an old man, but I also witnessed his Shaivic superfast 5th dimension walk on Ram Jhula, casual walk with haversack on his back, managerial walk in his office… – all are so different and unique. Sometimes he had eyes of Jesus and many times, expressions of Baba. Many times he looked like Jesus, especially in his photos from Serbia. Few times he appeared like Bhagavan Nityanada. His feet changed from soft pink feet of Krishna to hard rough ones like Baba. He expands and contracts in no time. He is all Masters. He is not only spontaneous, but extremely unassuming too. Mr. Dipak Haksar has a beautiful altar at his home, with photos of all Masters that came into his life. On 29th August, in his house, I had a profound mystical experience and saw expressions/features of many of those Masters in Mohanji, all at one time! I always feel that Mohanji is just an illussion. He probably does not exist. His expressions are not really his. He expresses various Masters as per the need of the moment and his body changes accordingly, as to who operates through his body at that time. One day he made me feel his spine from the distance of 2-3 feet! Warm contours of spine were so clear at that distance. My medical mind was completely shattered. He easily changed between dynamic energetic Shaivic expressions, to smooth tranquil compassionate Vishnu expression. I have seen him expressing extreme compassion and extreme anger for seemingly insignificant matters. I now realize that through his expression of anger, something is cleared, changed or moved from the receiver or visitor. He scolded one lady during the recent class. When his Shaivic energy entered her through his scolding, the next day, she developed fever. Mohanji said “No problem. She will be alright in 3 days. She had a software change. Things would be different in her life.” His anger never depresses a person instead it energizes the person. Though this lady had a fever, she also was active a lot! A strange combination! Sometimes he had Lord Ganesha on his forehead and at many times we saw AUM and trident .. and now a shining purple Third eye in the Vashishtha cave! I have heard him chanting Marathi arati and Sanskrit shlokas. He has never learned Marathi (at least not in this life!) – and most definitely, I cannot forget my experience of Mohanji recording BTW meditation in Hindi, which he never spoke so fluently. As mentioned before, he has never learnt any scriptures. He hardly reads any books. He is truly spontaneous. Knowledge flows through him effortlessly and timely. Along with these different divine expressions, I have also seen his pure dharmic expressions – as a son, father, husband, friend or Guru. I have seen him working endlessly in the office, with full responsibility. He is an employee too! I have also witnessed his reverence, gratitude and surrender towards higher Masters, his senior spiritual Gurus and colleagues. It is pleasant to see him prostrating with head and heart in one line flat on the ground. I have seen a patient Guru in him. 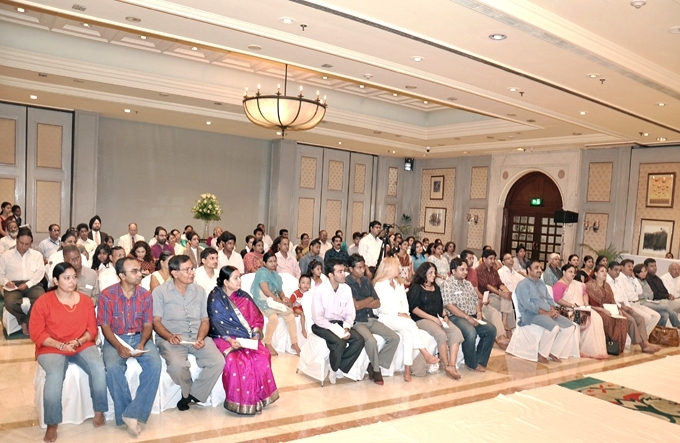 I have noticed the unconditional love towards all those who attend and do not attend the meditation. He melts when he sees animals. 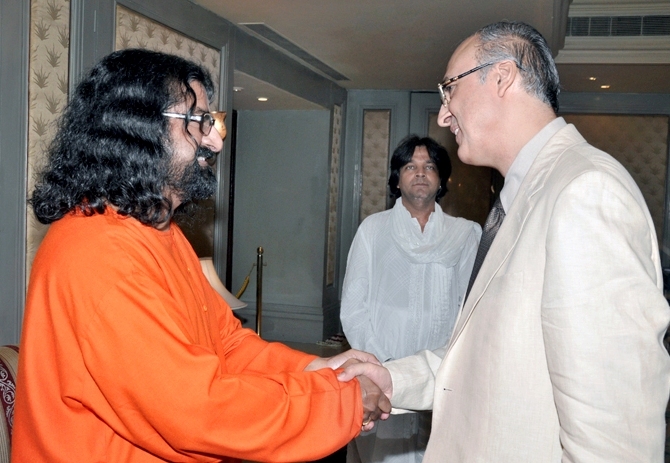 I saw him operating effortlessly in the five star hotel and also in an Himalayan ashram…. complete contrast in environment, yet, he is as fluent as ever. He is the same, where ever he is. 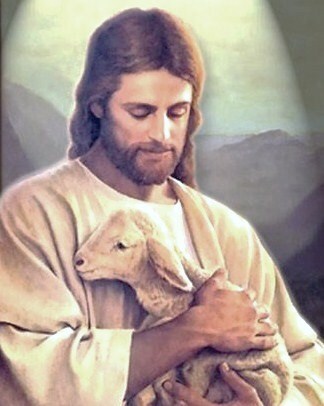 He is the same to everyone, irrespective of the status of the person who comes to meet him. He discriminates between none. His powerful existence remains unchanged in all situations of terrestrial dualities. These are all examples of his different plane of operation and existence. Furthermore, his dharmic expressions have given different dimension to the understanding of karma to me. Our karma may get over. We may be able to exhaust our karmas, but dharma will continue. Fulfilling dharma is an endless process which may be more difficult too. For all of us …Let karma and dharma happen together and later let it be only dharma flowing through each soul without having any emotional afflictions. In his words, “Karma is individualistic while dharma is universal. They co-exist. Every being is expressing both simultaneously, but differentiations blur because of the mind factor which creates do-ership. One example of we being a dharmic being is that we may be causing destruction of many beings like ants, unknowingly, when we move around. There are numerous micro beings that meet their physical death when we breathe. We have no control over this. This is dharmic existence. When we breathe out, trees breathe in the same air. Likewise what the trees breathe out, we breathe in, this is also dharmic co-existence. Karma ends when the body ends. Dharma continues, eternally”. 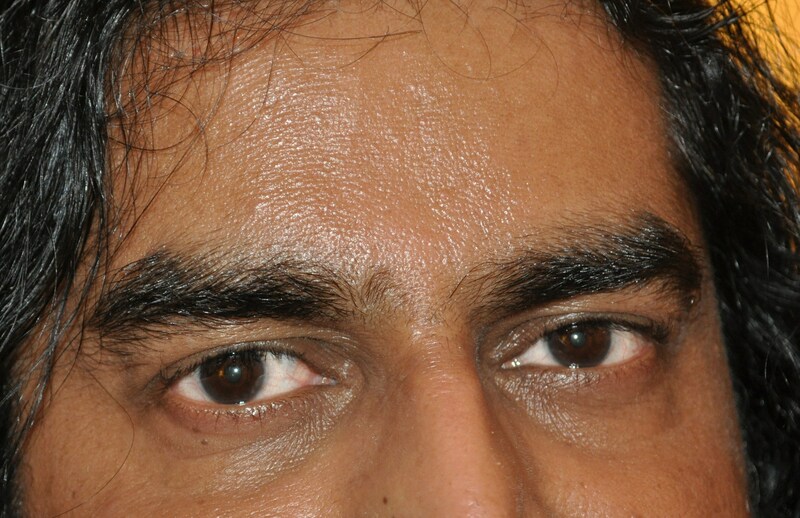 Normal human being’s expressions have patterns and constitution but Mohanji’s expressions are original, dynamic, pattern-less, and cannot be framed or predicted. Each frame has a validity, duration and purpose. When we try to catch him in any frame, he destroys it. We went to the Samadhi. Mohanji closed his eyes and communed with the great Master Lahiri Mahashaya at His samadhi. After spending some time at the Samadhi, Abhishek took us upstairs to the Shivaling installed on the terrace in a small temple. Mohanji sat cross-legged in meditation in front of the Shivaling for some time and did abhishekum again. He then came to Nandi and kept his hands on Nandi with steady gaze at Shivaling. 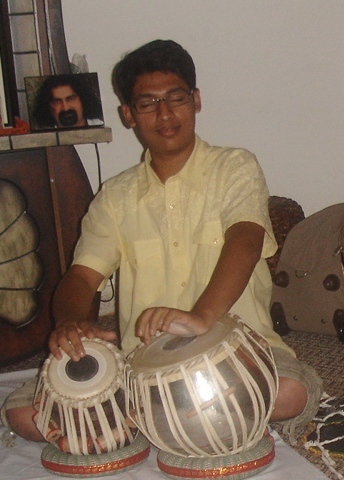 “…..this afternoon I was playing tabla. There was a strong and unusual pull towards sitting in meditation. The pull was so strong that I could not resist. I saw myself in the Jangli Maharaj temple, along with my grandmother (Jangli Maharaj temple is a powerful place in Pune, India, with a beautiful Shivaling installed in a cave). I saw Mohanji and Shivaling. He was intensely involved in the pooja. Suddenly Lord Nandi appeared. I cannot clearly mention whether Mohanji was talking to him or blessing him. I have never had a vision of Lord Nandi before. This meditation was extremely strong. I feel so light after this spontaneous meditation!….. mamma, I was trying to reach you desperately to convey this experience!! I was surprised. Mohanish was just overflowing on the phone with great excitement. His experience happened exactly at the same time when Mohanji was communing with Nandi and Shiva at the Lahiri Mahashaya Samadhi. 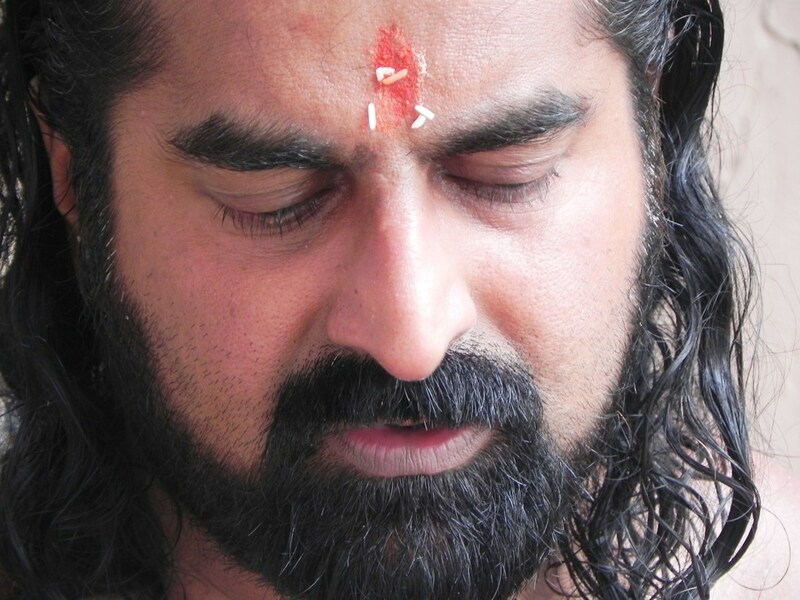 Mohanish was deeply touched by the experience and felt a big transformation in him. He was also surprised that, without ‘doing’ anything, he went into deep meditation. 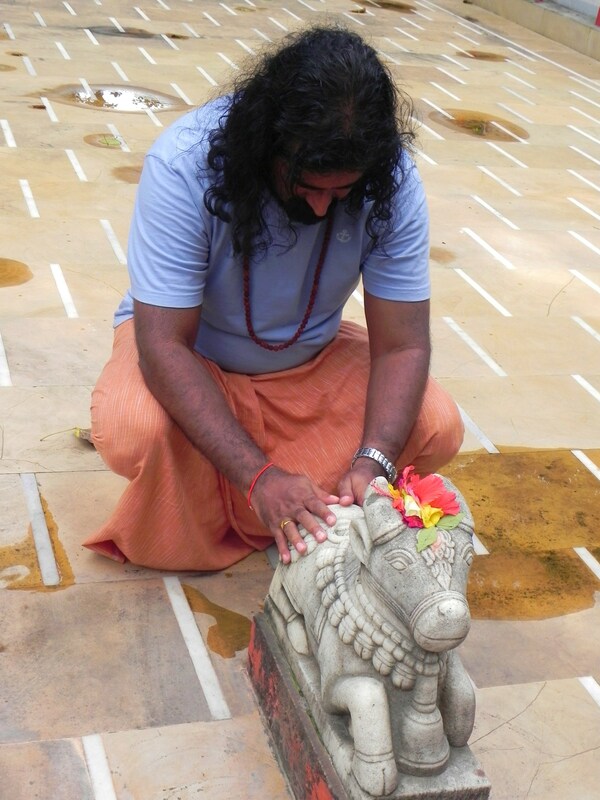 Then slowly, I told him today’s story of Vashishta cave, Lahiri Mahashaya’s Samadhi and Mohanji’s intense communion with Nandi…….Mohanish could not believe that he experienced everything that Mohanji did, sitting so far away in Pune…. His connectivity with Mohanji is so strong, that no words, phone calls or communication is needed to taste Mohanji’s consciousness from anywhere and be with Him always. What a connectivity! This was another lesson for me, about the realms of the higher, as well as the super connectivity beyond any barriers. After these amazing moments filled with divinity, we decided to go to Har ki Pauri. When we were walking towards the car, we saw an old man standing under a tree. He looked like a farmer.When we were to get into the car and start our onward journey,Mohanji again looked at this old man standing under the neem tree where our car was parked. I was sure that this man was not there when we arrived at the place. I have always observed that Mohanji is not attached to any of his actions. He just performs the required deed and walks away without any attachments. There is a certain spontaneity in all his actions. Nothing is deliberate or artificial. This makes it even more difficult for a city being, who operates on set patterns, expectation and standards, to move with him, as he is so unpredictable. A great lesson – attachments and expectations breed sorrows. Har ki Pauri (meaning ‘divine feet’) is a famous spiritual place. It is the place where a drop of Amrit (divine nectar) fell when Garuda was carrying it. It is a place where Kumbhamela is held at, every 4 years. The most recent Kumbhamela was in March 2010. I was eager to bathe in Ganga at Har ki Pauri. It is said that it cleanses our karmas and sins of many life times. I am sorry to state the filth we saw at Har ki Pauri. The place was full of rotten food, flies, bad smell and what not. This is an important spiritual place. It is probably difficult to maintain it due to millions of people attending with great faith. When I expressed this concern to Mohanji, he simply said, “Does it really matter how the place is? Do external situations matter at all? Of course, we must preserve the cleanliness of our surroundings. Yet, what really matters is the cleanliness of your inner space. Har ki Pauri has spiritual significance. Is it that all those who come here really get transformed? NO. Transformation depends upon your purity, faith and surrender. Bathing in Ganga is important as there is no river on earth like mother Ganga, but later on one should take efforts to maintain that inner cleanliness too. We have to preserve our inner purity through selfless thoughts, words and action. Do we actually do that?” Those words had the power to pierce the strongest mental blocks. He had a strong point here. I thought, ignorant people throw dead bodies of their relatives in Ganga, with the belief that the dead relative will attain salvation. Unless inner purity is achieved, salvation is impossible. The dead body will only pollute our beloved mother Ganga. Mohanji was so true. From Har Ki Pauri, we had to go to bus station to drop Abhishek. He was to go back to Delhi. Abhishek had so many questions in the beginning. He was extremely talkative and pouring out theoretical knowledge where ever possible. He had many references to quote! He had read a lot of literature. He was eager to be with Mohanji, share his thoughts and ideas, and take Mohanji’s advice. 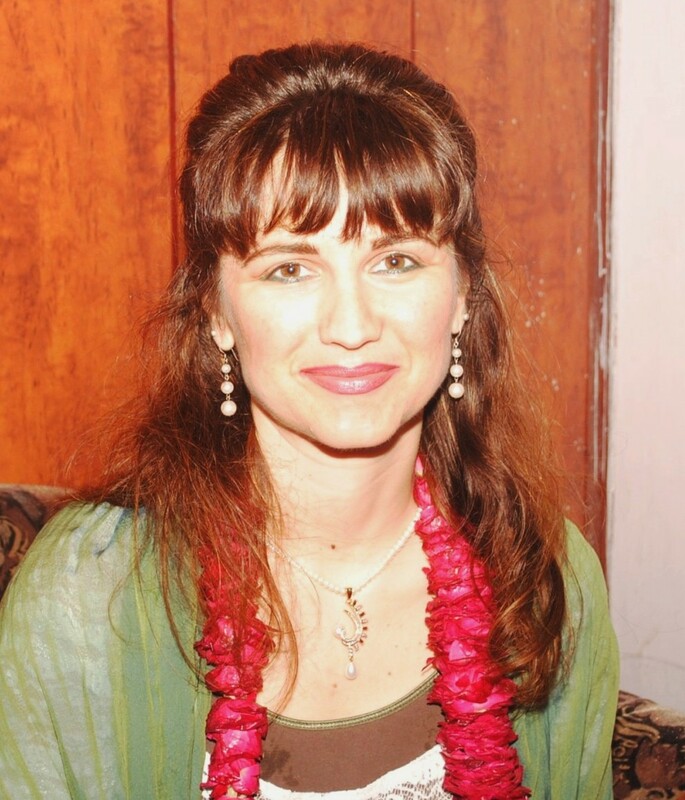 “….While I was reading “The Autobiography of a Yogi”, I had deep desire to have mystical experiences in the Himalayas. In Vashishtha cave, I sat on the rock next to Mohanji. I entered a deep state of meditation, where, I could see Mohanji’s many past lives, which he confirmed as true to me on the way back, to the Ashram. I could clearly see his many forms. 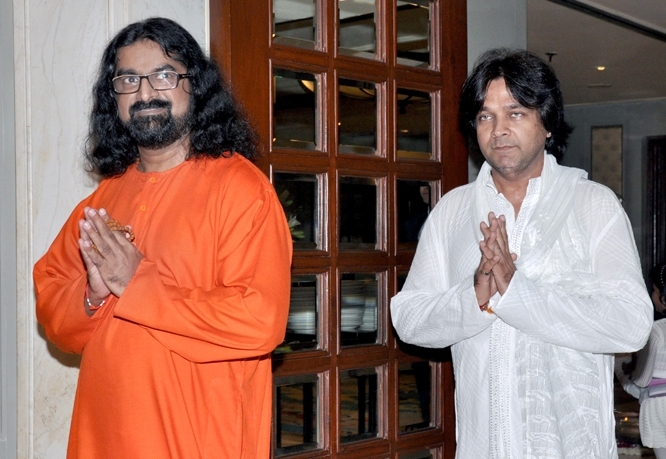 Mohanji explained to me that Lahiri Mahashaya is not different from Babaji. And that Babaji will appear to us in the form we can understand, because the deathless Yogi is beyond mind & forms. Dear Abhishek, thanks for being there, otherwise I would have never seen Mohanji in this consistent mode of elevating the consciousness of a seeker. Let me tell you ….Mohanji never speaks in vain. Mohanji’s words directly hit our shushumna (at the spine) and Kundalini – deep cleansing and transformation is then inevitable. The rituals of death anniversary were to start at 11am at Shivananda Ghat. The time was 10.40am. Mohanji suddenly said, “Let’s go to Geeta Bhavan to buy a few dhotis (long cloth which is tied around the waist and offered to Brahmin priests as part of the ceremonial gift).” Geeta Bhavan was almost 2 kilometers away across Ganga (on the other side) and we had to cross Ram Jhula – all this in 20 min, as the priest was expected at exactly 11AM. What really surprised the medical doctor in me was that he was not at all tired or panting after this super fast walk, and most surprisingly, neither was I panting! My heart rate did not change much, which normally it should. I did not even feel that we walked so fast, shopped and came back! It was all in a daze or trance kind of situation. I was as normal as I could be and so was he. What a graceful walk. Were we walking on the earth or was it a walk in the 5th dimension, on a different plane of existence?!! I am really sure that this is impossible in normal conditions. I’ve had the pleasure of “knowing” Mohanji for the last 11months only, but what I have gained and experienced during that time is precious and beyond my wildest dreams. Looking back, I wonder – “Have I actually known him/understood him at all?” The following experiences will clarify what I mean. 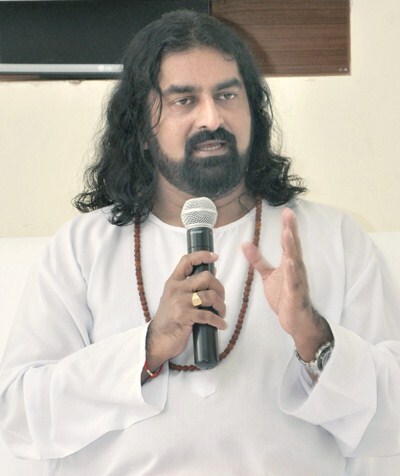 Allow me take you through what I experienced of him in the last few months and the recent 4 days in Haridwar and Rishikesh. This is rather long, so dear readers, I request your patience. 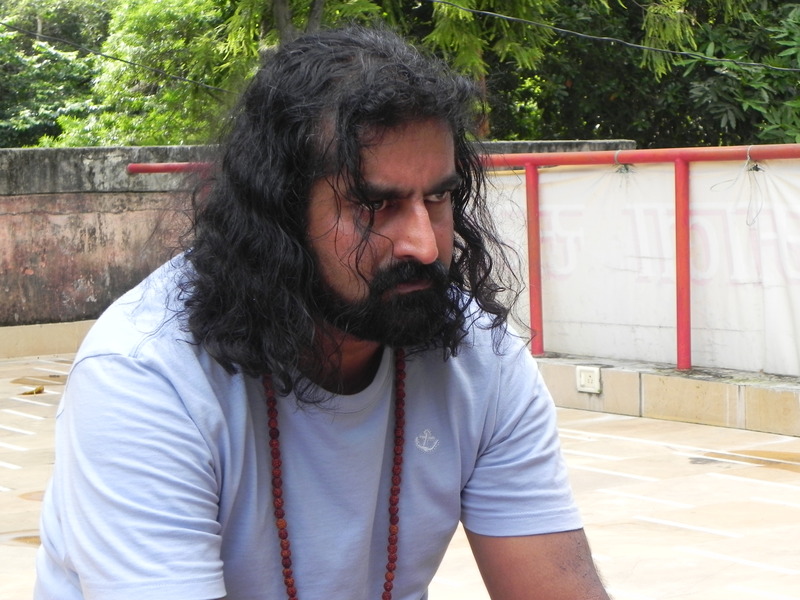 The day after the meditation in Gurgaon, on the early morning of 30 Aug 2010, Abhishek from New Delhi and myself both set for the journey with Mohanji towards the land of great Mahatmas – Haridwar and Rishikesh/Tapovan in Uttarakhand, India. I never thought of why and what will be happening during this journey. I just knew that I am accompanying Mohanji. At this juncture, I think it would be relevant to point out some intricacies related to this journey. I understood that Abhishek wanted to travel with Mohanji to the Ganges. But, apart from giving the date and time of travel, Mohanji had not given any further guidance. Abhishek booked his own ticket and traveled with us, even though he was in a different compartment. I started realizing the determination of this young man. The more Mohanji tested his determination, it only grew. I started realizing how Masters test the determination of the seekers who approach them. 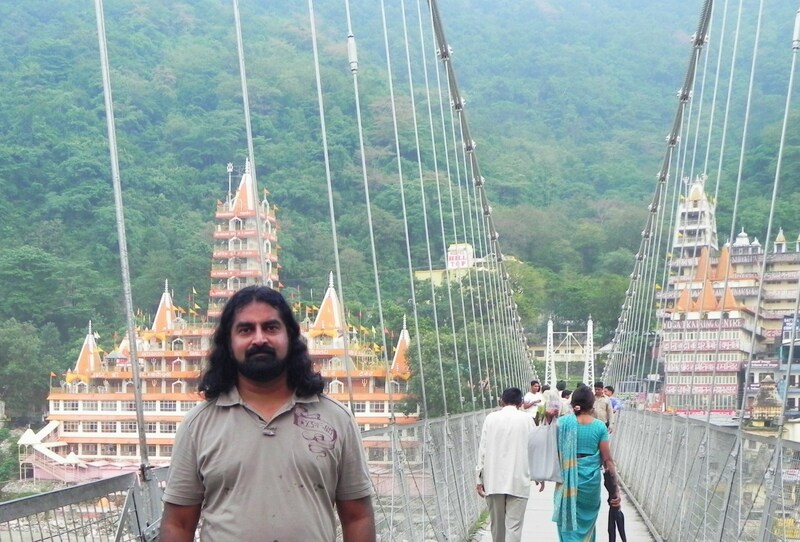 Abhishek passed all the tests and he traveled with Mohanji through Haridwar, Rishikesh and Vashishtha cave. I could see him changing, literally in front of my eyes. Initially, he was asking many questions and had many wishes and demands which he expected Mohanji to fulfil for him. Later on, all wishes and demands dropped off, and he went into deep silence mode. He got what he wanted from Mohanji. This was indeed a wonderful revelation for me – what sheer faith and surrender, along with determination, can do to us. Abhishek realized who Mohanji was and was not affected by his seeming indifference. Once Mohanji was satisfied with his tenacity, he showered grace in abundance. I believe Abhishek can tell us more about how he felt. 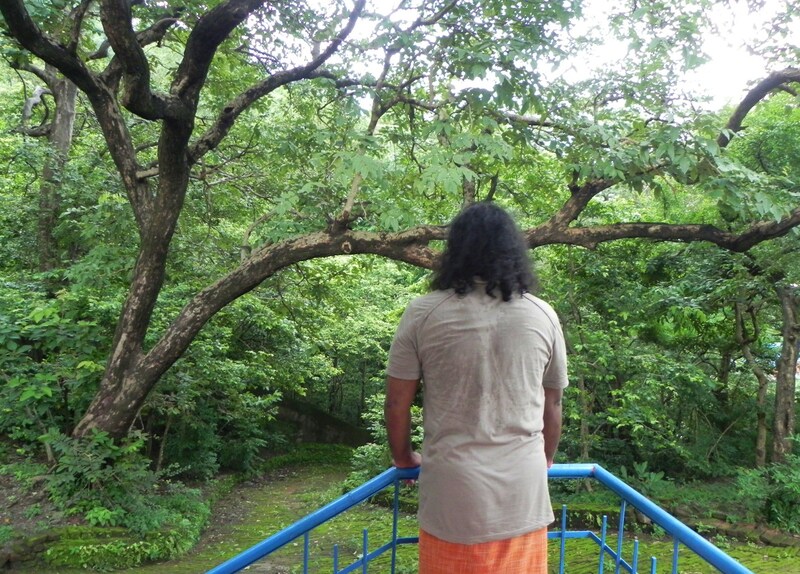 We stayed in Vanamali Mataji’s Ashram in Tapovan, which is few kilometers ahead of Rishikesh. Swami Mohanji of Vanamali Ashram had organized a car for us to reach Tapovan from Haridwar train station. We sat in the car – first thing we noticed was Shirdi Sai Baba’s photo, blessing us with a smile. When our car just left the train station compound, driver was surprized to see that the car engine has some problem….. Hari Aum! He struggled, but car could not be started. We decided to take another car, which the driver gracefully organized. Mohanji smiled and said, “Baba has taken care of some hurdles in the journey.The car had a problem, not us.” I smiled as I remembered Biba’s experience sharing of their car’s flat tire while they were coming back from Shirdi after Mohanji’s birthday in 2009. 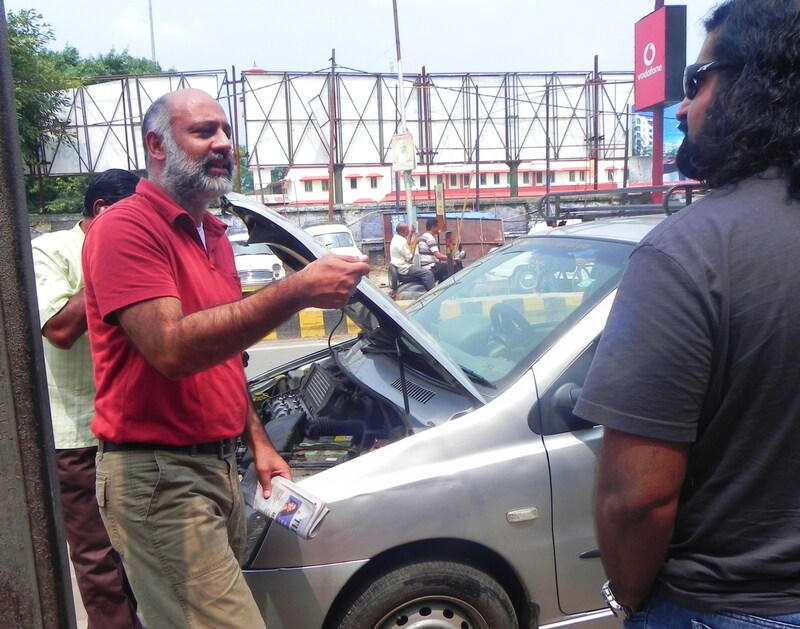 Baba beautifully transferred the problem to the car and kept them safe. We reached Tapovan safely within 1.5 hour. Mata Devi Vanamali gave us a warm welcome. We had a comfortable and affectionate stay at her place for the next 3 days. That evening we went to the famous Lakhman Jhula. I was eager to have my first darshan of river Ganga. 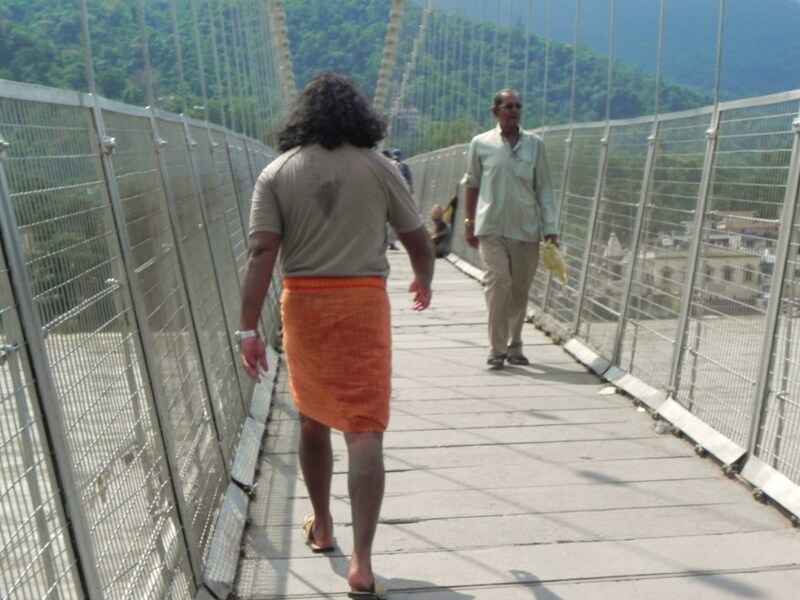 We crossed Lakshman Jhula bridge and, right at a corner, there was a Hanuman temple. Mohanji who did not go to any other temple on the way, walked straight to this Hanuman temple and instead of entering, stood outside and had darshan from outside. I was surprised why Mohanji did not enter the temple. Soon, the old priest of the temple invited Mohanji inside the temple as if Hanumanji himself is calling, chanted few mantras and applied long and beautiful saffron tika on Mohanji’s forehead. He then asked Abhishek and me to take the darshan of Hanumanji. The priest did not repeat the same with us! I kept watching this. Who actually was that poojari? I felt that it was Hanumanji Himself – he had a particular, most unusual tejus. Otherwise, why did Mohanji skip all the other temples on the way and come to only this temple, and that too, as if he came all the way only for this? I was just following Mohanji. Abhishek had so many questions that he kept Mohanji busy answering. 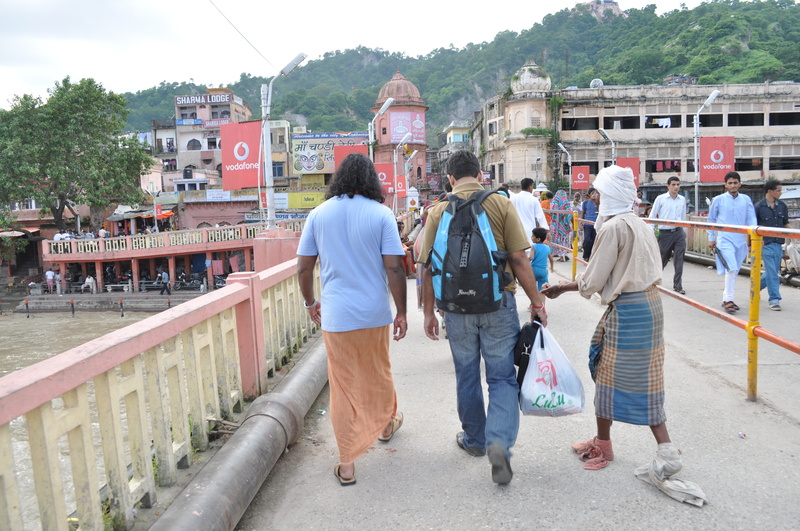 We went down towards Ma Ganga (Mother Ganga). 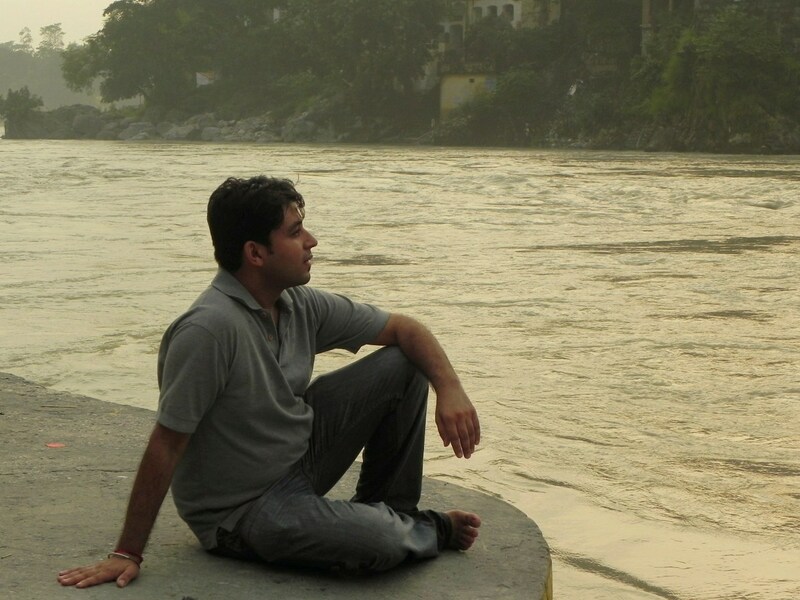 This was the first time I saw the flowing Ganga. I could not move my eyes from her majestic flow. Ganga is incomparably beautiful!!! And that too, to visit Ganga along with Mohanji!!! I was overwhelmed. 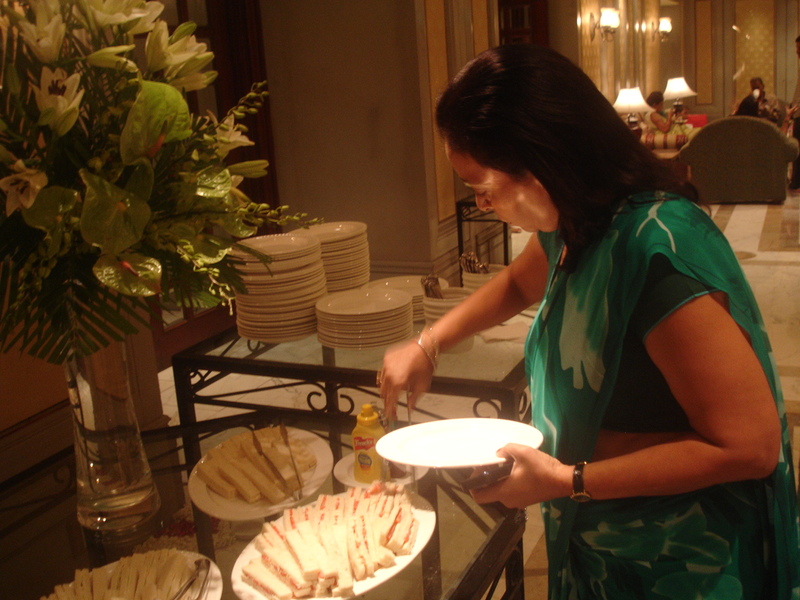 She looked so graceful, flowing fast, did not have time to wait for anyone, taking everything that came to her…. She is indeed beautiful. Mohanji smoothly walked into the water and prayed. I waited outside. I did not want to enter the water without his permission. Then he said: “Just dip your feet in the water.” I politely and gratefully entered the water. It was very cold but felt extremely relaxing. Keeping feet in the water, I was watching Ganga. Something profound was happening within me. It felt as if so many things are leaving my body and flowing away in Ganga. I am getting cleansed. I am becoming light. I remained in that bliss and expanded state for the next few hours. So many people around were playing in Ganga, but I felt they were just enjoying the cool river water and, sadly, not comprehending the magical divinity of Ganga. Next day morning three of us set for Vashishtha cave. 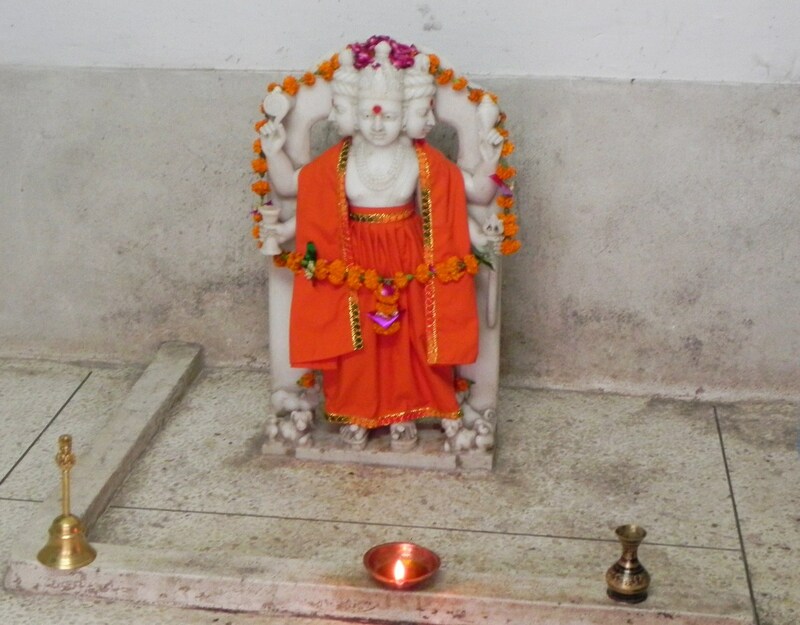 Rishi Vashishtha, one of the Saptarishis, was a great Rishi and Guru of Ikshwaku Vansha of Lord Ram. Road from Tapovan to Vashishtha cave was a ghat with tall mountains on one side and the flowing Ganga deep down on the other side. Driving became extremely difficult due to recent landslides. It took us around 1 hour to reach there. We took darshan of Purushottamanand Maharaj and Mohanji lead us down to Ganga. He said it would be auspicious to bathe in Ganga before entering the cave. Vashishtha cave: We started walking towards Vashishtha cave. Mohanji went ahead of us. Entrance appeared very small. We could only see a small flame inside. We walked in. It was dark for my eyes. I could not see anything. I got confused and lost sense of direction but kept walking, sensing the walls. Suddenly I saw Mohanji sitting on a platform inside the cave, near the Shivaling. He asked for fruits and coconut that we had brought with us. He offered fruits, bilva leaves and coconut at the Shivaling. He then picked up a copper jug and poured water on Shivaling and the hood of the protecting cobra chanting a beautiful Sanskrit mantra. This whole process is called Abhishekum. It was beautiful and divine. In that dark, cool and silent cave, that mantra chanting in his deep base voice had an extremely powerful effect. I am sure those mantras did not simply emerge from his throat! 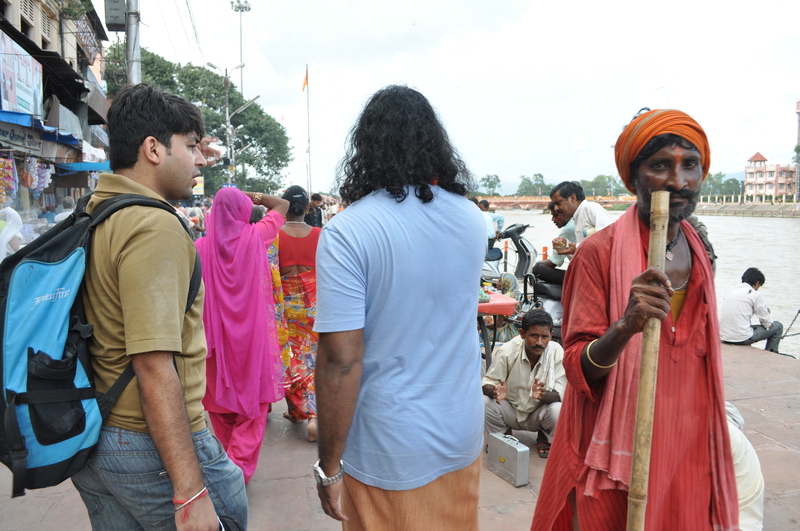 He asked for more water and asked me and Abhishek to perform the Abhishekum. He went into meditation again. Before that, I took his permission to have few photographs taken inside the cave. I could not see anything through the view finder of the camera. Everything appeared just dark. I blindly clicked a few photos. However, looking at the photos on LCD of camera, I was thoroughly surprised!. I could see a beautiful purple energy surrounding the cave especially around the Shivaling and Mohanji. This reminded me of the purple energy surrounding the pancharati during one of our BTW meditations in Muscat. It also reminded me of the purple energy that Dubai people saw during one BTW meditation when all sensed the presence of Mahavatar Babaji… This all had a deeper meaning and connection. Does it indicate the tradition of Mohanji? Does it indicate strong presence of Babaji and the Great Masters? I knew deep in my heart that we surely had the blessings of Vashishtha Rishi and all the other Great Masters who lived and meditated inside this cave since thousands of years. Their energy was present and quite obvious. It was unmistakable. By this time I had become bold. I clicked a few photos with flash on. My scientific skeptical mind…. wanted to know more about this energy… It wanted to see whether it was a camera effect!!!! 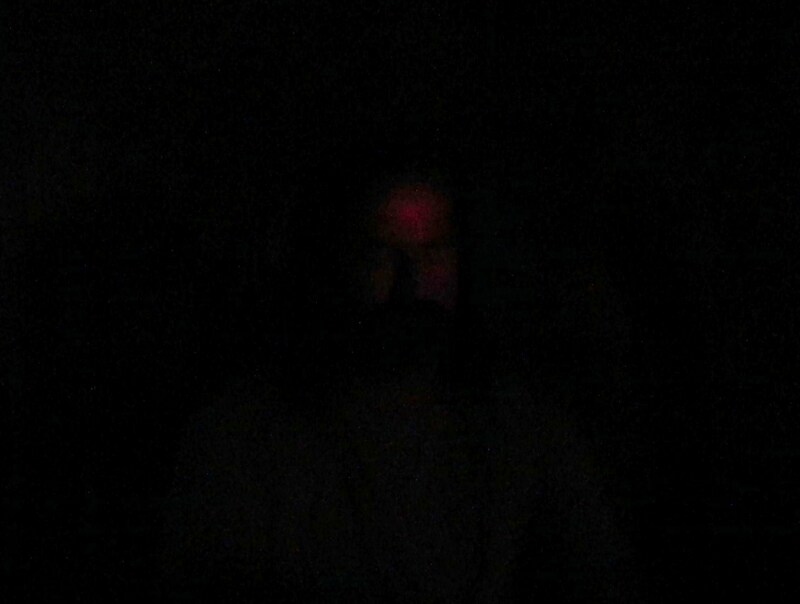 I usually do not prefer to use flash because its strong light disturbs the meditators and the meditation (and definitely not in this dark cave). The photo clearly shows where Mohanji was sitting in the cave. After a while, Mohanji then came down from the platform and sat on the floor. I again had his photo with and without flash. To my great surprise, the photo without flash showed only his Third Eye shining in purple. Rest all is dark! Only His third eye existed!!! This was my very profound experience. After coming out of the cave, I kept thinking how could Mohanji walk straight into the pitch dark cave, as confidently as He did? How did he know what is kept where in the cave? He was functioning as if he existed or dwelled there before… Maybe in another life? Or he visits the cave during his frequent astral travels? Everything seemed so familiar to him…. 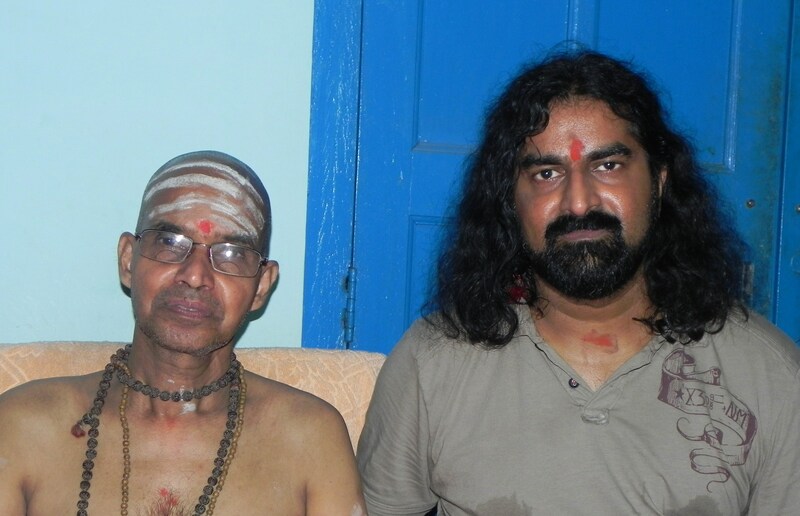 Meeting with Chaitanyananda Swamiji: Mohanji was looking forward to meet Swamiji, the direct disciple of Purushottamanand Maharaj. Swamiji was in meditation when we arrived, and so we waited. When he came, Mohanji prostrated at his feet, with his head and heart at same level, flat on the ground. Prostrating this way means one’s head is not above the heart! One completely surrenders and also surrenders all intellectuality. I was touched by the reverence that Mohanji expressed to this aged saint. I loved his humility. Swamiji called us and insisted on having us for lunch. We refused but instead enjoyed the tea and biscuits with him. Abhishek had been to this place before. 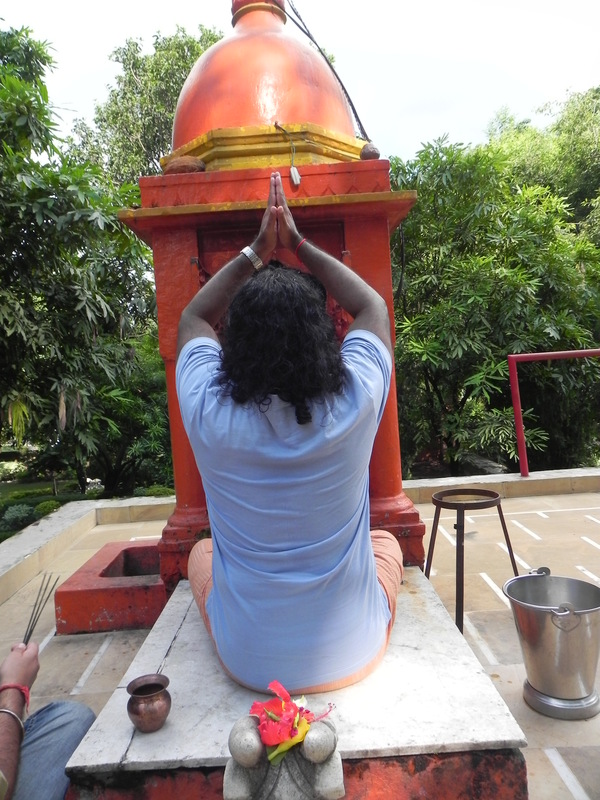 I was told that Swamiji does not allow anyone to stay there and simply ignores all the tourists! That is to maintain the purity of the place. Dear friends, so many days have passed after meditations in ITC Maurya and Gurgaon, and we are still receiving your testimonials and messages of gratitude – I am feeling so much love that I don’t know how to express it… :-). I came to know from a few of you that ITC Maurya meditation was experienced as ‘multidimensional’ and that many could smell “a subtle, transcedental Divine fragrance” throughout the meditation (I will include some of the testimonials in this post). As always when an experience like this happens at times most unexpected, the mind just becomes blank. A few minutes before, we were casually chatting with Mohanji over lunch, and then, all of a sudden, there is the presence of Jesus in him. As you can probably imagine, it is quite tasking for the mind to follow these tremendous shifts in Mohanji’s inner space and put aside its logic – I do hope I am getting there slowly, through repeated experience, by allowing the heart to take over :-)…. 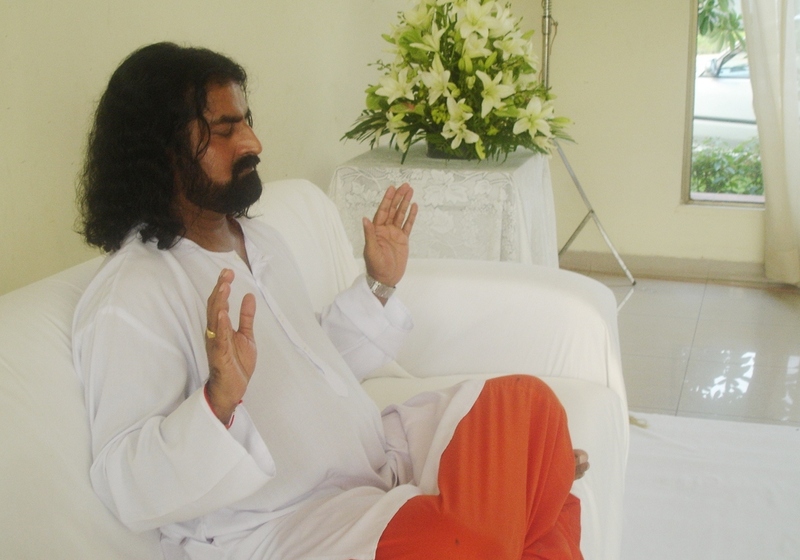 On the day of meditation in Gurgaon, Mohanji insisted he should wear a white kurta. I would like to share with you an interesting story about how his choice of clothing happens :-). 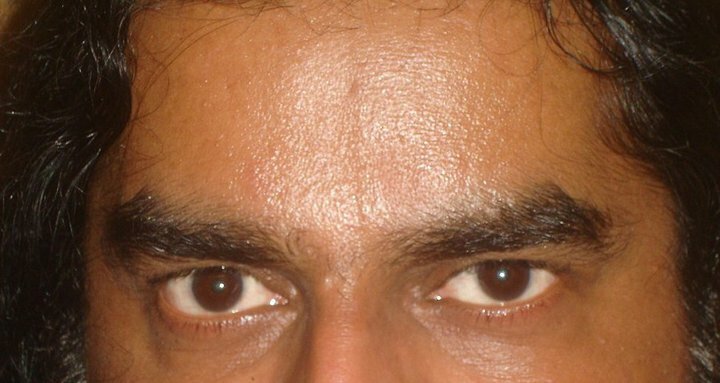 That same day we noticed that, on one of the pictures of Mohanji’s eyes, there is a face of Shirdi Baba clearly visible on his forehead/third eye, as if slightly leaning to the right (Richa enlarged it and gave it to Dana as a suggestion of a table stand photo). We never noticed this before – again, Baba’s leela. 🙂 The moment this lady stepped into Dana’s and Ranvir’s suite, she noticed the above-mentioned photo and simply got glued to it. Then she looked at Mohanji (who indeed was wearing saffron 🙂 ), and was completely zapped. After she became more comfortable with all of us, she shared this story and that was the start of our bubbly outpour of various experiences with Shirdi Sai (and Mohanji). In the end she received Shaktipat, for the first time in her life, was stunned by the ‘heat of the palm’ and left deeply touched and speechless. I found this to be really amusing – a typical example of Baba’s leela. If we were to analyze why Baba asked Mohanji to wear saffron, we surely would have never guessed something like this 🙂 – another proof why we should never analyze Masters’ instructions and simply obey with faith and gratitude :-). I’d like to share with you one more most unexpected blessing that happened, just 2 hours before our meditation in Central Park, Gurgaon. 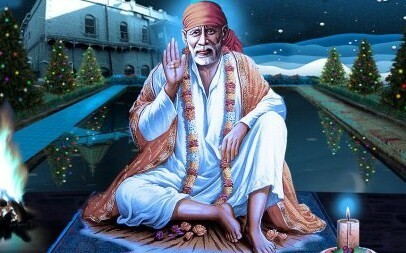 Abhishek told Mohanji that, just a few minutes away from Central Park, there is a beautiful temple of Shirdi Sai Baba called Sai Ka Angaan (Sushant Lok, Gurgaon). That’s all I heard about this place. To my great surprize, when we reached Sai Ka Angaan, we realized that it’s a proper REPLICA of Shirdi – with Dwarkamai, Baba’s dhuni – everything except the crowds! We were overwhelmed. Moreover, there was one golden looking life-size statue of Baba sitting gracefully on the floor like a Raja – I swear, all of us felt this is a LIVING BABA smeared with gold, and will move any time (unfortunately, photos are not allowed..). The statue is just SO REAL – I had goosebumps while looking at it… time stood still. 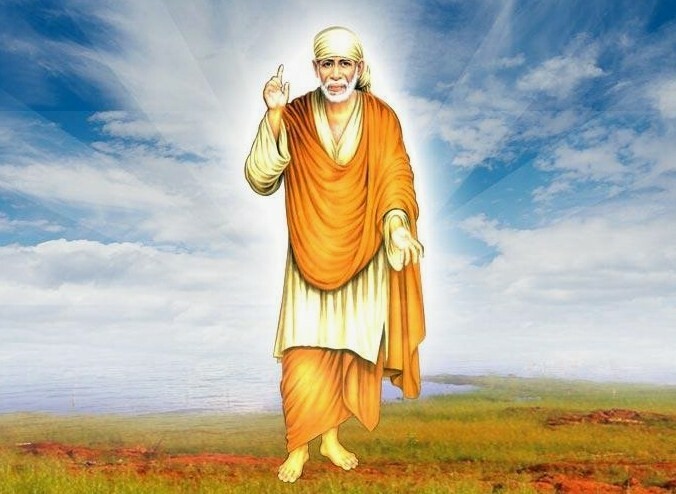 One of our friends had a sudden flash from her past life in Shirdi – Mohanji then further clarified what she saw, and, to her great joy, added a few more details. Those were unforgettable moments. After offering coconuts and coal for Baba’s dhuni, we left this sacred place feeling so blessed and assured that Baba is fully taking care of the upcoming meditation… We hurried to have a shower and lunch, in order to reach the meditation venue on time. 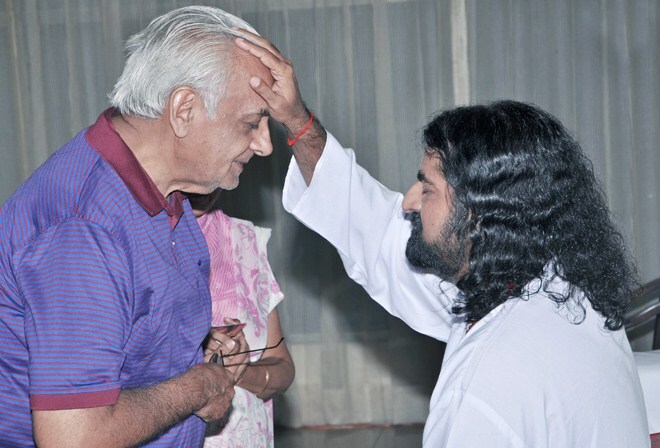 And that was when Mohanji called us to the bathroom to look at his face in the mirror – I never expected to see the expression of Jesus… Baba loves us to experience the unexpected :-). 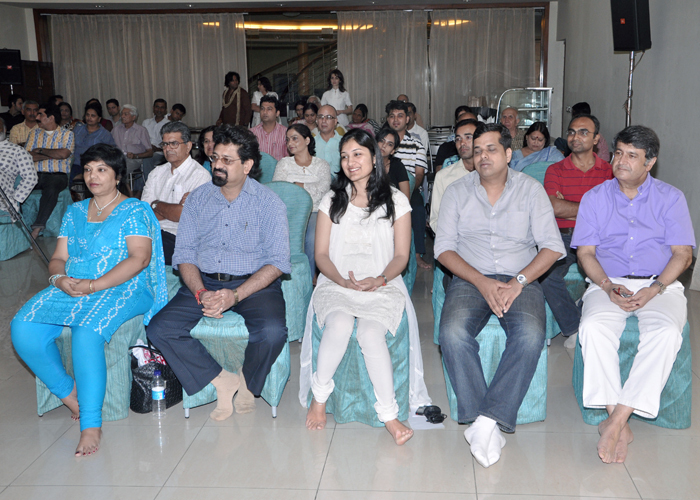 The meditation in Gurgaon, and Satsang afterwards, thus had a completely different flavor. 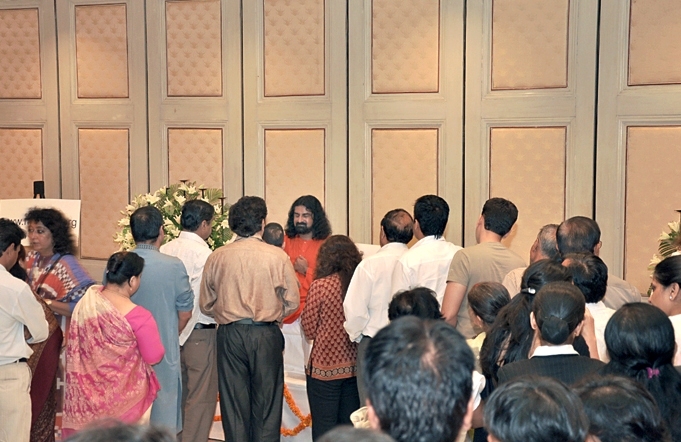 The turnout was again surprizingly big – but as per the Divine plan, there was exactly enough space for all. There were many people who already attended BTW in ITC Maurya the previous day, and said they ‘felt the pull’ to come again. As always, this meditation was unique – amazing energy filled up the room from the very beginning of meditation… We felt the presence of the Masters…. After the meditation was over and Q&A session started, I noticed how beautiful all the people looked – the expressions on their faces were so loving and serene… (Video recording of the Q&A will be shared with you soon). 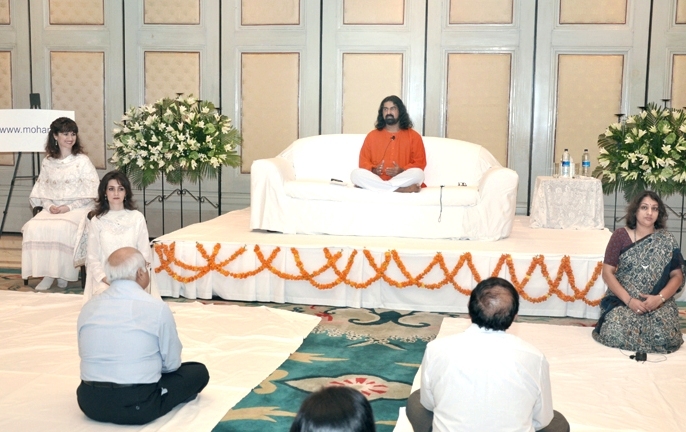 The Shaktipat session was incredibly beautiful, filled with grace – its effect was profound and lasting. 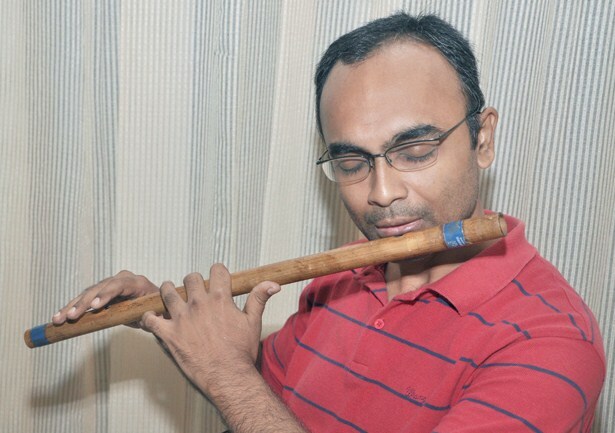 To express his love and devotion, our new friend (in this life, that is..:-) ), Vinay K. Jha, brought his flute and played so beautifully, while others were queuing for individual Shaktipat. 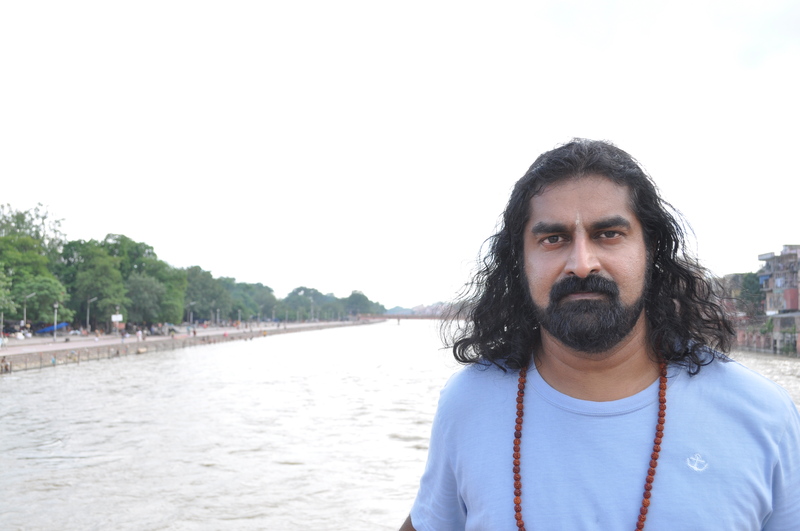 This is Vinay’s meditation experience sharing: “I’m still wrapped in warmth of peace and joy….want to express the feeling but no word has yet been known to express the experience that comes from beyond-mind state. 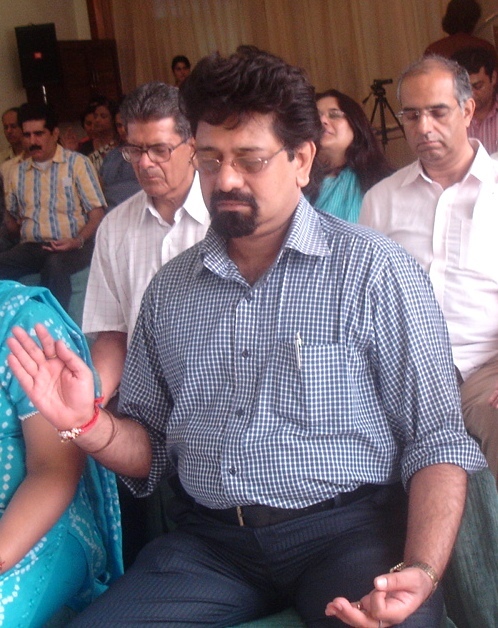 In Gurgaon, I had difficulty in coming out of meditation. I knew I was there, but I didn’t know where is the eye to open and where is the palm to look at. By the time instruction came to raise the right hand in the blessing position, I had already lost the sense of left and right. I just felt some external force was raising some part of my body with little murmur of muscles that I could hear. At last, when instruction came to lower down the right hand, I found it was never raised, and left hand was raised instead. These were just the experiences that I could express via words and are just the tip of iceberg. The submersed parts are still enjoying the depth of love and blessings that Mohanji, Bibaji,Dr Deepali ji and Dr Vishwajeet ji have given us. Vishwajeet: “Thank you so much angel sister Biljana. Namaste from me and my wife Shalini. We have been given so much by our spiritual master Mohan ji that we do not have sufficient words to express our gratitude. 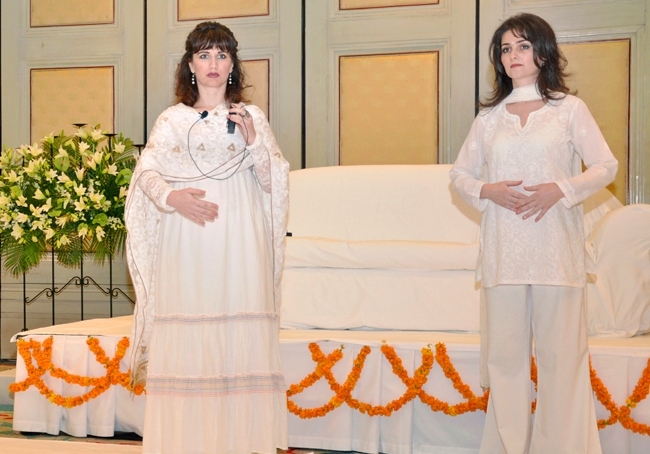 Both meditations were highly intense – with high emotions, an amazing experience of love and light and bliss and healing, and so many blessings together. I am still having intense effect at crown chakra, full of bliss and bliss and bliss, even after 24 hours of Shaktipata, and want it to continue like this ♥. 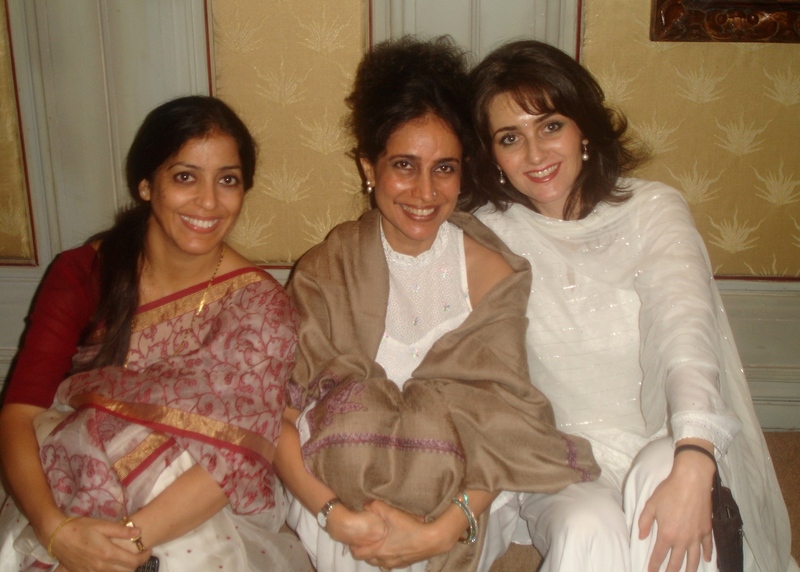 No words can explain my experience – as if I have done a higher Kriya for hours…. ….Mohan ji is a Jagadguru and this term came to me a few days back from the Source by intuition. I am not coining this term but it is as it is – ‘Jagadguru’, meaning Guru of the whole world, whole universe. That is what I consider him to be. 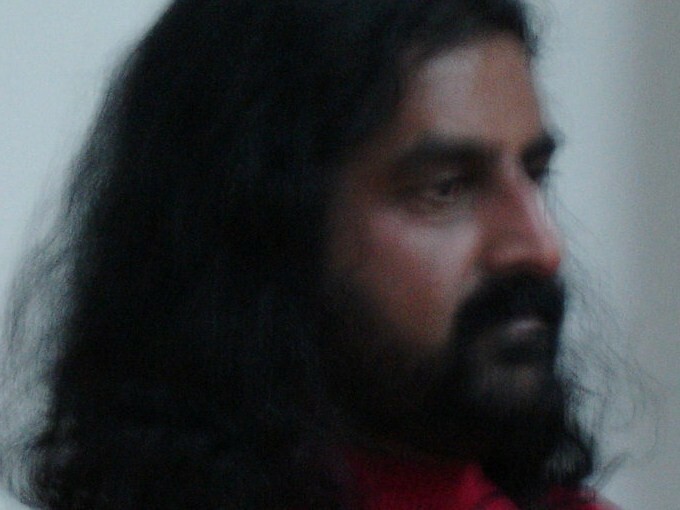 Everyone had highly intense experiences – Vinay, Anju, Sikh Sufi friend Pinta, Paritala ji, Anand ji and just everyone. And today I received Dinesh Saxena ji’s phone call and he was so happy – even today he felt the similar experience which he had at the time of Shaktipat. 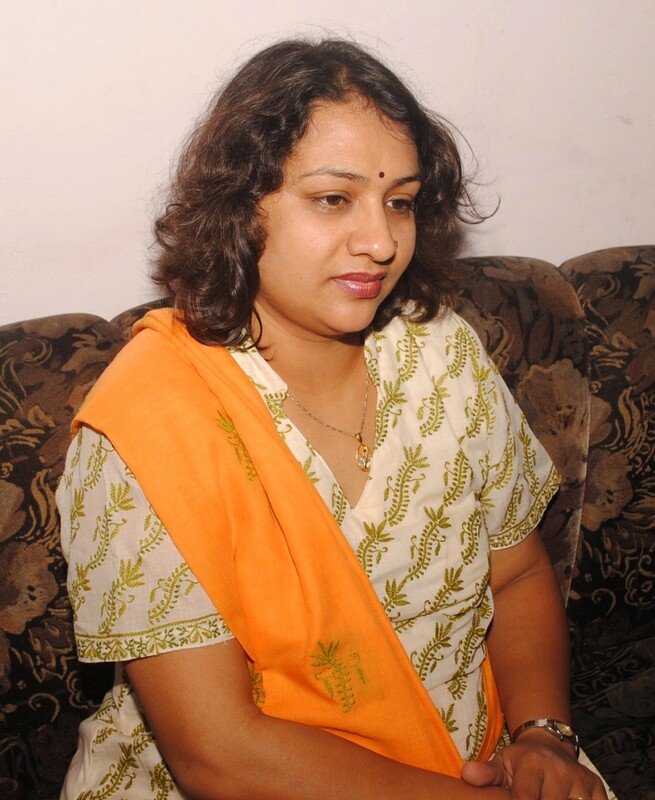 Ruchika G.: Thank you Mohanji for the blissful experience and initiation. It was my first time meeting with you. Not only Babaji+Lahiriji+Yoganandaji, but there were many other Ascended Masters present in the prayer meeting. 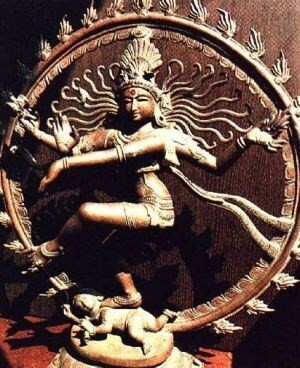 There is an exremely strong Shiva energy present with you. 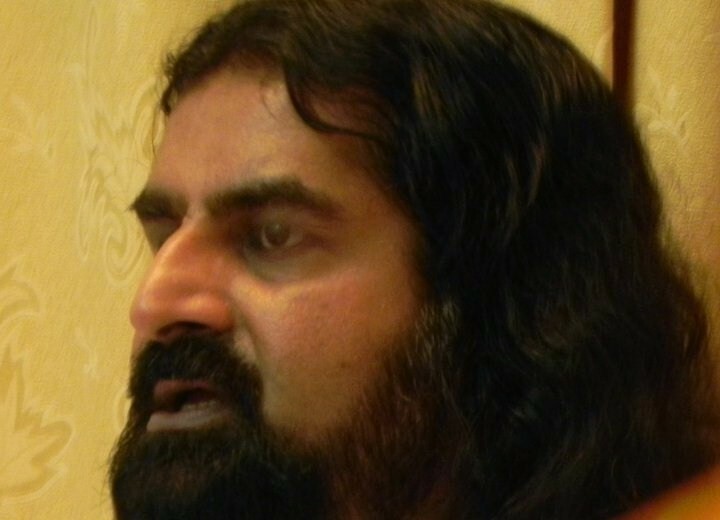 Anjani: I can’t point out exactly what has happened post Shaktipat from Mohanji, but I do feel something changing within me.. Maybe in terms of my handling of day to day issues of mundane life…or just sitting down in meditation…..One thing I can certainly say is that the image of Babaji comes to the closed eyes during meditation more often. And I somehow feel that pull which he has on millions across the cosmos…..
As far as Mohanji is concerned, when ever I think or concentrate of him, his deep powerful eyes, his assuring voice saying “I AM HOLDING YOUR HANDS” echoes in my subconscious. And it feels so good – that I just can’t describe it in words. Furthermore, till date, I used to pray and subconsciously call upon Mother Divine ‘Shakti’ only whenever I prayed or meditated…..But now, by Mohanji’s grace, his and Babaji’s pull is pretty visible, as a subtle new wave churning underneath the subconscious…..
Anju:“[…]When we were meditating in Mohanji’s presence, the powerful energy waves in that room became so strong that I felt a surge of energy crushing me against my seat, something I have never experienced before during meditation. ITC Maurya - Mohanji entering the hall, escorted by Pradeep S.
Dear friends, I hope that the attached images from the amazing meditation Mohanji conducted in ITC Maurya hotel in Delhi last Saturday (Aug 28th) convey the expansive joy and memorable moments all of us experienced. 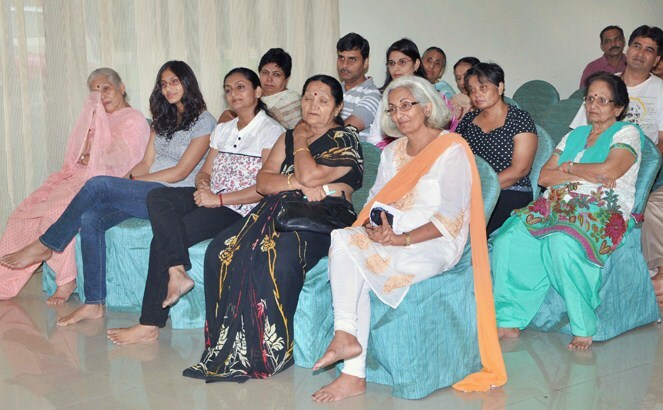 The turnout was overwhelming on both days (Saturday in ITC, and Sunday in Gurgaon), so much so that, altogether, more than 250 people experienced the grace of BTW and Shaktipat! ITC Maurya - the hall full! After the meditation and Q&A (which was incredibly long – 1,5 hours), Mohanji personally gave Shaktipat to each and every person. We intended to conduct the meditation in ITC Maurya from 11am till 2pm. In the end, the event continued until 6pm! Pradeep Sukhrani who came from Dubai just for this purpose, and of course my dearest sister Dana who coordinated everything. Special thanks goes to our dear Richa Sharma from ITC Maurya, who did a lot of legwork and answered many calls in order to make this happen, as well as dear spiritual brother Vishwajeet, whose help in numerous ways was invaluable (and whose devotion was so strong that Mohanji insisted we visit his home day after the arrival, irregardless of the busy schedule). With everyone’s contribution, everything went just perfect. I was amazed to see all of this unfolding before my eyes – a thought came that, indeed, we have come a long way since our humble beginnings in Dubai in 2007…. 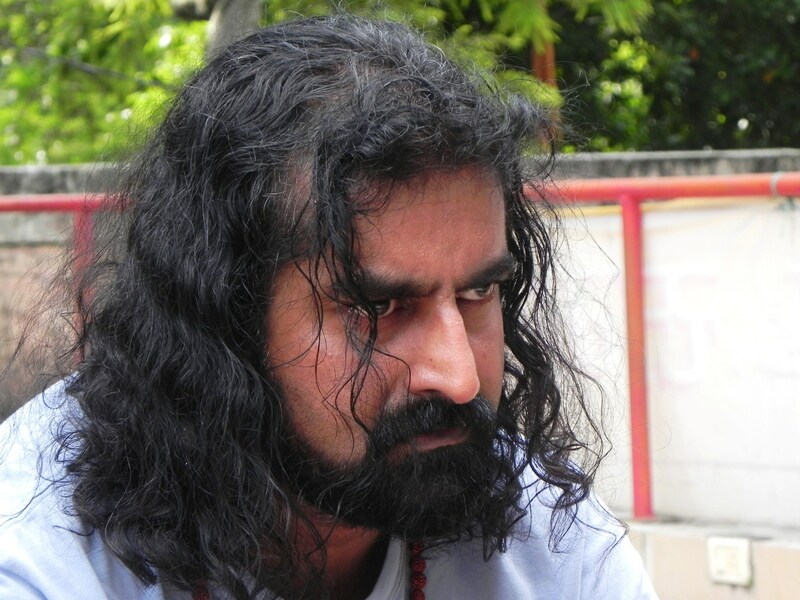 I hereby welcome our many newly joined yahoo group members from Delhi – please do share with us your experiences of meditation and Shaktipat (you can post a comment to this blog or by mail) and feel free to ask any questions/clarifications from Mohanji. Mohanji answering ALL the questions, until mind is chatter-free -and only Joy remains!